5 Compartments for plus size smart phone charging and stores watches, wallet, coins, keys, etc. Great organization for dressers, nightstands and table-tops. High class PU leather finish. Interior velvet lined. Beyond the Amazon's A-Z protection policy, you are backed by Surpahs' 100% satisfaction guaranteed program. 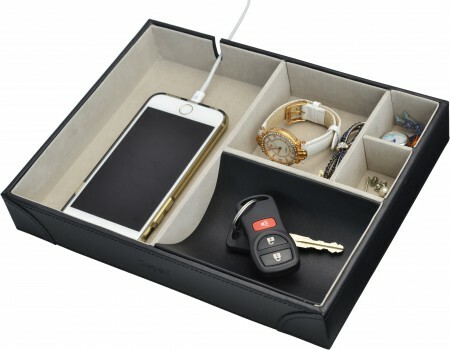 - 5 Compartments for Cell Phones, Watches, Wallets, Coins, Keys, etc. - Great organization for dressers, nightstands and table-tops.